There is not just one Hilton Hotel Melbourne. There are two on either end of the city and another one at the airport - each large classy 5 star hotels providing quality, service and style. The Hilton On the Park is overlooking Fitzroy Gardens, and the Hilton South Wharf is at the super modern southwest end of the city, next to the Yarra. The Hilton on the Park is a 419 room, classy ambient hotel within walking distance to the Paris end of the city, and just across from the MCG and the other Melbourne sports venues. It has great city views over the tranquil Fitzroy Gardens. It is located in the established and affluent East Melbourne. From there it is also only a short way to the Bridge Road shopping and café precinct. It has elegant freshly renovated rooms with large windows that open - and that get more exclusive the higher you get. The hotel is designed in beautiful natural tones, has a fine Restaurant and Lounge, a well-equipped gymnasium, outdoor swimming pool, as well as the Hilton day spa and wellness centre  all arranged for your relaxing stay in Melbourne. For secure bookings and very best prices, you can book the Hilton on the Park here - No Reservation Fees! 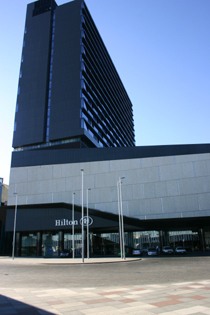 This new Hilton Hotel Melbourne is a modern 396 room complex near the Yarra riverside at the South Wharf, the newly developed area in the southwest Melbourne. It is all modern and glass, and away from the hustle of the city. Being located next to the Exhibition Centre and the DFO, it is an ideal location if you are in Melbourne for a convention or exhibition. From the hotel you can take nice walks along the Yarra. The CBD, Docklands and South Bank are not all within walking distance. From the fantastic rooms and suites of the Hilton South Wharf you can get panoramic Yarra River, Port Phillip Bay or city views. There are even self contained apartments for your longer stays. You can book the Hilton Melbourne South Wharf here! Prices for Melbourne Australia Hotels vary according to the season and Melbourne events. Booking over the internet will give you a discounted rate. You can make a booking for good deals and last minute hotels here. Have your say about this! Leave us a comment in the box below. I promise to use it only to send you Insiders Melbourne. Or 'Like', or +1 this site! © copyright 2007-11, We-Love-Melbourne.net, PO Box 322, Carlton North, VIC 3054, Australia While all care is taken, we make no claim as to the accuracy of this information and cannot take responsibility for any actions taken as a result of it.